The dust has barely settled after an emotional, eventful semester, but Chasity Parker, Malajia Simmons, Alexandra Chisolm, Sidra Howard and Emily Harris return to Paradise Valley University to tackle yet another one. Walking away from her abusive relationship, Malajia hopes to be able to move on with her life. That hope becomes reality when an unlikely person expresses interest in her. But when a past mistake comes back to haunt her, Malajia is not only faced with a difficult decision, but the weight of her past comes crashing down—threatening her sanity and her new relationship. Between trying to cope with her loss and facing the uncertainty of her relationship, Chasity has been trying her best to hold it together. When a face from the past shows up, bringing with them shocking news and a bold request, Chasity is left feeling both angry, and confused. With her world being turned upside down, Chasity isn’t sure how much more she can take before she breaks. Academic probation behind her, aside from a few tough class assignments, Emily should be relatively stress-free. But the strained relationship with her mother, whom she hasn’t spoken to, still weighs heavy on her. When a family tragedy brings Emily face-to-face with not only her scorned mother, but another bitter family member, Emily hopes that the strength that she’s gained is enough to handle the confrontation. Certain group members’ friendships become closer, leaving Sidra both feeling left out and acting out. Even her best friend doesn’t have much time for her anymore. But Sidra must learn that in order to truly be a good friend, she must check her selfish tendencies, and be there for them in their time of need. Not only are new books being opened this semester, but so are old wounds. As much as this group desperately wants to move forward, past pains are holding them back. They must decide if they’re going to allow the past to continue to have a hold on them, or learn to forgive in order to move on and close out their junior year in peace. 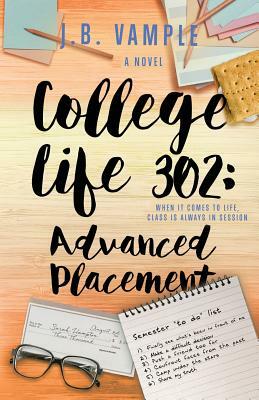 Tell us what do you think about College Life 302: Advanced Placement (The College Life Series, Vol 6).